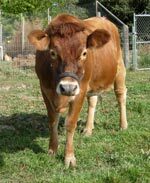 "All our animals are given access to adequate pasture. Unlike confinement operations, our cows roam pastures and eat grass, as a cow should! Chickens are omnivores, and are meant to eat green plants as well as bugs, and so we give them adequate room to scratch and forage. We believe in raising animals with respect and care. If you would like to see our farm and see what we do, just contact us at 899.6682"
Tina is a like second mother to her goats! She cares for them so diligently and thoroughly that her vet says she has the healthiest goats she's ever seen. The goats have free access to pasture and are supplemented with vitamins and calcium, along with alfalfa and dry feeds. Jennifer raisies meat chickens for us and does a fantastic job. She raised chickens for years for her own family and willingly raises a big batch now so we can all benefit! She allows her chickens to free range, and what's more, grows chickens at the right time of year when it's not too hot for them to move around freely (spring or fall). She supplements these big eaters with antibiotic-free chicken food. "Our beef is fed home grown or locally grown feed that not been genetically modified. They are not given growth hormones or antibiotics. They are processed at an USDA inspected facility. Our beef is fed home grown or locally grown feed that not been genetically modified." 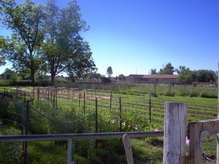 In 2006 we decided to convert part of the pasture behind our recently purchased old farmhouse into a large garden. Ever since the pasture has grown smaller while the garden has grown bigger, as has our enjoyment of watching plants pop out of the ground and giving us what we need. We use natural fertilizers and old-fashioned hard work to keep the garden looking and growing well, no chemicals used. Pure Food Co-op LLC provides local producers a way to put farm fresh products into the hands of consumers through a home delivery service. Products, such as raw milk and fresh eggs, are collected directly from the producer and delivered directly to the members of the co-op. Customer service, marketing, product labeling, billing, and ordering are handled by the co-op. Consumers rely on the co-op to investigate producers and select those that meet standards of production and quality, and producers rely on the co-op to effectively and responsibly market, handle and distribute their food items. We are looking for more small-scale food producers to join our co-op. If you are a producer interested in joining, please submit an application! Want to know the details of your food producer and his or her practices? Each bottle of milk is lableled with the permit number of the producer, so you always know where your milk came from. Alongside each producer listed to the left, you will see a disclosure form that goes into details about how each producer raises and handles the food items they offer. State tests are conducted at least 8 times a year, usually monthly. Results of testing provided along with details of which tests are conducted and why. Click here for testing results and testing information.